It’s about that time again—the act of road-tripping across a series of states, taking large sums of money for a range of books, getting those books signed by authors, seeing those authors read, attending a diverse set of panels that delve into various levels of meaning and importance. . . This is how I like to describe the AWP experience. When I was a junior in my undergraduate, I received an invitation in the mail regarding AWP. The front had a mailing sticker with “McKenzie Sanders, Poet.” I was still a Sanders, then, hardly weeks engaged to my husband, and the “comma Poet” made me giddy. While I know retrospectively that the “invitation” was sent because of my subscription to the magazine, rather than my actually being of any real importance in the literary world, I was hooked on the idea of attending this thing. Later receiving an email confirming my beliefs that this would be a big deal, the attending, it was final: I was going. Because I was young, and because I’d never gone across multiple states alone before, my mother simply required that I have someone along for the ride. Eventually, my then-fiancé consented, and we drove the sixteen hour trip from Northern Indiana to Denver, Colorado—the place I would love to live for the rest of my life!—for the Tuesday through Sunday experience. . . which amounted to driving all day Tuesday, picking up AWP registration materials and exploring Denver on Wednesday, Conference on Thursday, Friday, and Saturday (which consisted of my day-long fascination of the conference, followed by an evening spent having dinner with Dragan and, either, exploring Denver or attending a reading), and driving all day Sunday. We still look back as a couple as that trip being some of the six best days of our life together. That trip was the decision-maker: I went back to AWP the next year, 2011, in Washington, D.C., and again in 2012, in Chicago. While both of these trips were fantastic, there was something particularly special about Denver—perhaps because it was my first AWP, or because it was in Denver, or because, let’s face it, I had my best companion by my side for the trip. But something about the vibe, the excitement, the overall involvement in literature and language, was more deeply woven in Denver, Colorado. Then there’s the 2013 rendition in Boston, Massachusetts. Unfortunately, due a range of issues, this will be the first AWP in four years that I will not attend. I cannot say that I am happy about it, or that I have truly come to turns with the fact that I am not going, yet. What I continue to remind myself of is the fact that it is fairly unlikely that I will be able to attend EVERY rendition of AWP for the rest of my life, but also that missing one year will not automatically result in a rockslide of never-attending-again-itis. There will be more AWPs, under better conditions! So, for this year of taking some time off, I’ll be giving myself a little retreat, as it were. For the most part, I intend to disconnect from technology—Facebook, texting, etc.—though I will have to check my email every once and again for my students’ needs, and I will probably post here daily, simply for commitment’s sake. Otherwise, it should amount to time for reading, writing, and relaxation. It should be a good, much-needed, writing time. 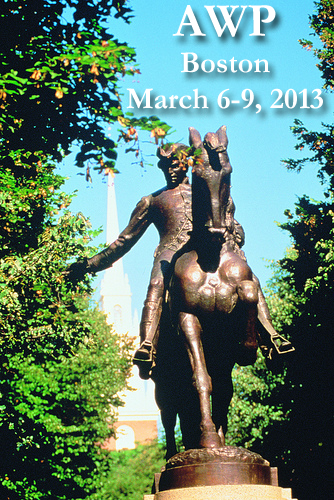 To those of you out there planning to attend AWP, I wish you all the best enjoyment. Safe travels, and please do read something good for me. Until later ~ Best, from me. I will think of you the whole time I’m there!